Does The Embroidex Embroidery Machine Starter Kit Offer Everything That Newcomers Want? Anyone that has bought a new embroidery machine may benefit from adding on a pack like the Embroidex Embroidery Machine Starter Kit. Embroidery machines are a great investment for people that are keen on sewing and needlework and want to take their skills to the next level. The only problem is that some of these machines can be a little limited in the accessories and elements included in the box. A starter kit like this is an appealing prospect for those that want everything they might possibly need before they start, but does this one make the grade? What benefits have buyers appreciated about this Embroidex Embroidery Kit? The first selling point of this kit is the fact that it includes so many tools and physical elements that are designed to help first-timers with their sewing adventure. There are 24 different spools of embroidery machine thread, so plenty of colours to use on different designs, as well as general bobbin thread, needles, scissors and stabilisers. Buyers are pretty impressed with the variety of colours and the way that it allows for freedom of expression, rather than a basic kit with some introductory colours. In fact, many say that there is more in the box than expected. In addition to this, this pack offers designs and instructions to help users turn these threads into beautiful patterns via their new machine. There are Anita Goodesign and Dakota Designs available to try – 20 of each – many of which are pretty and some quite involved. There is also the instructional CD that offers tips on how to get started. Aside from the odd software or connectivity issue with the CD, most seem to find it helpful and easy to use. The other benefit here is that these positive comments don’t just come from people with one type of machine. Instead, this appears to be benefiting multiple users. Are there any clear problems with this Embroidex Embroidery Machine Starter Kit that need to be addressed here? For the most part, buyers are happy with what they receive. However, there are some lower rated comments that highlight issues in quality. Some of the accessories are not that well made, with many immediately pointing to the scissors. They will cut and last a short while, but some prefer to use a more reliable pair. This all leads to a generally cheap feel to the product that has disappointed some. Summary: does this all mean that this Embroidex Starter Kit is a worthwhile purchase? The product description for this kit talks about “a thoughtful selection of all the essential embroidery paraphernalia”, and this does seem to be the case here. The important thing to remember here is that this is starter kit. There is the sense that the parts are cheaper so that the makers could include more of them, and it is this variety that it the clear selling point here. 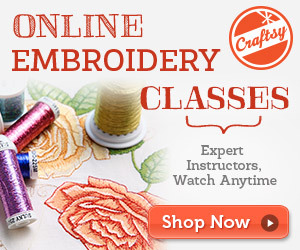 The Embroidex starter kit may not last long, but the features, designs and instructions are sure to help many newcomers get started with their embroidery machines. Find more reviews about the Embroidex Embroidery Machine Starter Kit on Amazon here.